Crown Publishing Group (NY), 9780307884848, 365pp. Misfit, truant, delinquent. John Robison was never a model child, and he wasn't a model dad either. Diagnosed with Asperger's syndrome at the age of forty, he approached fatherhood as a series of logic puzzles and practical jokes. When his son, Cubby, asked, "Where did I come from?" John said he'd bought him at the Kid Store and that the salesman had cheated him by promising Cubby would "do all chores." He read electrical engineering manuals to Cubby at bedtime. He told Cubby that wizards turned children into stone when they misbehaved. Still, John got the basics right. He made sure Cubby never drank diesel fuel at the automobile repair shop he owns. And he gave him a life of adventure: By the time Cubby was ten, he'd steered a Coast Guard cutter, driven a freight locomotive, and run an antique Rolls Royce into a fence. The one thing John couldn't figure out was what to do when school authorities decided that Cubby was dumb and stubborn--the very same thing "he" had been told as a child. 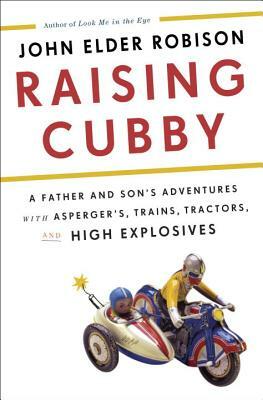 Did Cubby have Asperger's too? The answer was unclear. One thing "was" clear, though: By the time he turned seventeen, Cubby had become a brilliant chemist--smart enough to make military-grade explosives and bring state and federal agents calling. Afterward, with Cubby facing up to sixty years in prison, both father and son were forced to take stock of their lives, finally coming to terms with being "on the spectrum" as both a challenge and a unique gift. Praise for John Robison's first book, "Look Me In the Eye"
"Lean, powerful in its descriptive accuracy and engaging in its understated humor...Emotionally gripping." --"Chicago Tribune"
"A fantastic life story told with grace, humor, and a bracing lack of sentimentality." --"Entertainment Weekly"
"Endearing...Robison is a natural storyteller." --"Boston Globe. JOHN ELDER ROBISON is the author of two previous books, the "New York Times" bestseller "Look Me in the Eye" and "Be Different." He lectures widely on autism and neurological differences, and is a member of the Interagency Autism Coordinating Committee of the US Dept. of Health and Human Services. John also serves on committees and review boards for the CDC and the National Institutes of Health. A machinery enthusiast and avid photographer, John lives in Amherst, Massachusetts with his family, animals, and machines. "Robison ... sheds some light on how having Asperger’s helped him cultivate an outlaw style of parenting...by turns hilarious, poignant, weird, shocking, and inspiring…This book will make you laugh, and make you think about how to parent a child who doesn’t fit into the neat categories we expect our children to occupy." "Funny and moving...A warmhearted, appealing account by a masterful storyteller." "Robison's third book starts with a bang--his description of the 'malicious explosion' created by his teenage Cubby that has the boy, who has Asperger's syndrome, looking at 60 years in prison, is as disconcerting as it is captivating....With the ensuing investigation and trial, Cubby and the author are drawn into a crazy world that threatens to tear apart their already delicate lives."